U2 singer Bono recently took time out from his current world tour to get up-to-date on global hunger by meeting with World Food Programme (WFP) head, Josette Sheeran, in Amsterdam. During their meeting, Sheeran gave the singer one of the distinctive red cups which symbolize WFP’s ‘Fill the Cup’ campaign to raise funds to help the 66 million children in the world who go to school hungry. 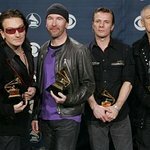 Bono noted that the number of hungry people in the world is “rising fast” and expressed admiration for WFP’s work providing free meals to more than 20 million children in school every year. 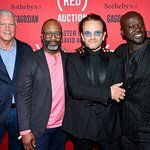 Sheeran and Peter Bakker, head of WFP’s corporate partner TNT, met Bono backstage at Amsterdam’s ArenA stadium, where U2 played the ninth show in their current European tour to tens of thousands of fans. When Bono asked about WFP’s work in Eastern Congo, Sheeran explained how the agency buys food from small farmers in that country to give to people displaced by conflict, thus boosting the local economy as well as responding to urgent hunger needs. Bono is widely known for his activism in seeking solutions to the problems afflicting Africa. He co-founded DATA ,an NGO aimed at eliminating third world debt, and the ONE Campaign, which aims to increase US funding for international aid programs. He has organized and played in several benefit concerts and has often met with influential politicians as part of his efforts to drum up support for development causes.